You are here: Home / Galaxy Note 5 How-to Guide / How to use Galaxy Note 5 apps screen? Everything about Galaxy Note 5 apps screen is explained: what is apps screen, how to access it, how to move apps in the apps screen, how to create and customize app folders, how to sort apps in apps drawer....? What is Galaxy Note 5 apps screen? Galaxy Note 5 apps screen is a special page where all apps, both pre-installed apps and apps installed by you, are listed. In other words, all apps that you can access are listed in apps screen. Some Android devices name it as app drawer. Unlike in some old Galaxy devices, widgets are NOT listed in Galaxy Note 5 apps screen. You can only see the list of available widgets from Galaxy Note 5 home screen (in edit mode). By default, app icons are listed in Galaxy Note 5 apps screen chronically. This means, by default, icons of newly installed apps are appended. Of course, you can move them individually or sort them alphabetically. You can also use app folders to keep apps screen neat. Although you can launch apps from Galaxy Note 5 apps screen, it is more efficient to add apps to home screen, then launch apps from Galaxy Note 5 home screen. How to access Galaxy Note 5 apps screen? To access Galaxy Note 5 apps screen, you can tap apps screen icon (9 white dots) on Galaxy Note 5 home screen as shown below. 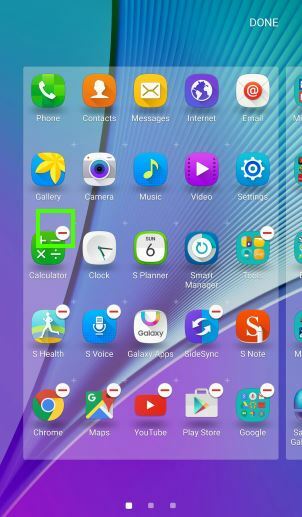 Please note, in some old Samsung Android devices, the apps screen (app drawer) icon is usually composed of 16 white dots, instead of 9 in Galaxy Note 5. Although you can customize the favorite tray with other apps and move the locations of other icons, you cannot change the location of apps screen icon. In other words, the apps screen icon is “fixed” in the favorite tray. This is to prevent accident removal of this icon and make sure you can access Galaxy Note 5 apps screen after customization. How to move apps in Galaxy Note 5 apps screen? create app folders to organize apps (read on). To move apps in Galaxy Note 5 apps screen, you may follow these steps. Step 2. Tap EDIT as shown below to enter edit mode of Galaxy Note 5 apps screen. When in edit mode, you may notice some apps or app folders have the “-” icon. This “-” icon indicates the app can be disabled (if it is pre-installed) or uninstalled (if it is installed by you). So, the “-” icon actually means removal. Step 3: Tap and hold an app icon to move to desired location. You should not release you finger from the screen until the icon is in the desired location. If you drop the icon to the top of another option, an app folder will be created (see below). If you drop the icon over an app folder, the app will be added to this folder. Step 4: Tap back button or DONE button to save the customization. How to create app folders in Galaxy Note 5 apps screen? If you have lots of apps, it is usually more efficient to use app folders to organize apps in apps screen. You can group similar apps in one app folder so that it is easy to find and launch the app. 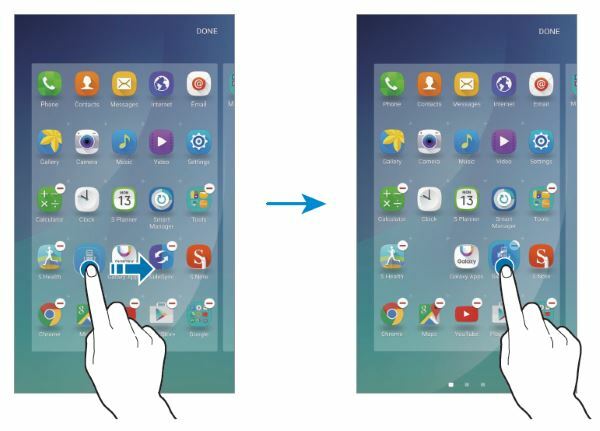 To create apps folders in Galaxy Note 5 apps screen, you may follow these steps. Step 1: Tap Apps screen icon in home screen. Step 3: Tap and hold an app icon and drop it on top of another app icon as shown below. You should drop the app only when a folder frame appears around the apps as shown above. You can give the app folder a meaningful name so that you can quickly find the apps after a few weeks. You can tap the color palette button to choose background color for this app folder. Step 6: Tap back button or DONE button to save the customization for Galaxy Note 5 apps screen. You can add more apps to the folder in edit mode by dropping the app icon on the top of the app folder. How to rearrange apps in Galaxy Note 5 apps screen? 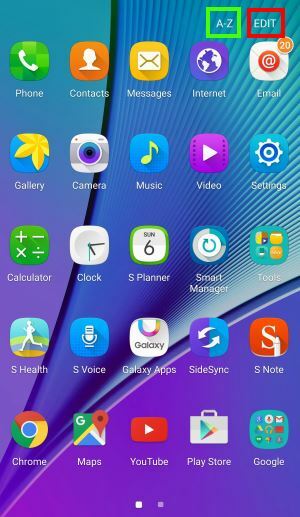 When Galaxy S6 was released, many owners were disappointed with the new apps screen because of the missing app sorting option. Samsung then added this app sorting feature in Lollipop 5.1 update. Galaxy Note 5 apps screen comes with the app sorting feature. In the edit mode of apps screen, tap A-Z button as shown above (green box), you can sort the apps alphabetically. Can you use Samsung Galaxy Note 5 apps screen? Can you customize Galaxy Note 5 apps screen now? If you have any questions or encounter any problems on using or customizing Samsung Galaxy Note 5 apps screen, please leave a comment in the comment box below. When trying to rearrange my app icons in the app box it will not let me do it when I put my finger on the app icon it automatically takes it right to one of the screens which I do not want, I only have 5 on my home screen so they don’t run in the background. I hit (edit- customize-hold app icon) and bang I’m on one of the several screens,wyd please advise greatly appreciated! Do you mean app favorite tray? If yes, your can use app folders in the favourite tray. When you put apps on the home screen, it doesn’t mean they will run in background. How do you hide your apps? I dont see that as an option like on my note 4. The default launcher in Note 5 doesn’t have the option to hide apps. You have to use third party launcher to hide apps. You cannot. You can manually arrange them. Of course, you can use other launchers which may have more options. The default is no order (just appending). How do I arrange my app drawer chronologically? It is currently alphabetical. The default launcher doesn’t have this option. You can only arrange apps manually or alphabetically. OK, I tapped the edit button and the screen changed to icons within a frame. Minus signs appear on each app icon, and plus signs are in the open spaces. When I attempt to tap and hold an app icon to move it, then nothing happens except the entire page will move side to side. I can’t figure out how to move these things. Help! Are you referring to app icons inside an app folder? Anyway, you should tap and hold the icon, then move your finger on the screen. You should not release your finger from the screen. The app icon should move with your finger. If not, probably you hold somewhere outside of the app icon. This site is great and I have learnt so much. Just have one problem. I want to organise my apps into folders and move icons to other positions but when I tap and hold to drag the icon nothing happens. What am I doing wrong? In apps screen, you need tap edit button first, if you want to move icons or manage app folders. Is there a way to show apps in list view vs icons? Try other third party launchers. For Samsung’s default launcher, easy mode has this feature to list apps in a list. But it’s not recommended. when arranged alphabetically can it go back to chronical order again ?? if yes hows that possible?? how do i change the background for the note 5…? Apps screen uses the same wallpaper as home screen. You can set the wallpaper in home screen. In Note 4, I could tap any screen “dot” and move to the corresponding page of that “dot” immediately. With Note 5, it will only advance once screen at a time with each dot “tap”, vice to the screen of the “dot” tapped. Can anyone tell me how I can change this to advance immediately to the screen of the “dot” tapped. This is the “new” feature of Samsung’s TouchWiz. No workarounds. Another annoying “new” feature is that you cannot cycle through leftmost or rightmost pages. I agree. Too bad there’s not an app that you can load to do the way the old screen used to work. I also find it very annoying. It’s part of the launcher. Some third party launchers may have some functions/features you want.